Quickly increase test coverage and assess business risks with an automated test strategy embedded in your continuous delivery process. Continuous testing is the process of running automated tests throughout your development lifecycle to obtain immediate feedback on business risks, such as delivery delays and defect leakage. TestComplete excels at continuous testing by allowing you to easily build automation frameworks with the tool's open architecture. By implementing continuous testing with TestComplete, your team can keep up with the quickening pace of development and deployment without having to make tradeoffs between quality, speed, and costs. Our open platform lets you easily create a test suite that consists of different kinds of automated UI tests from all stages of your development lifecycle. 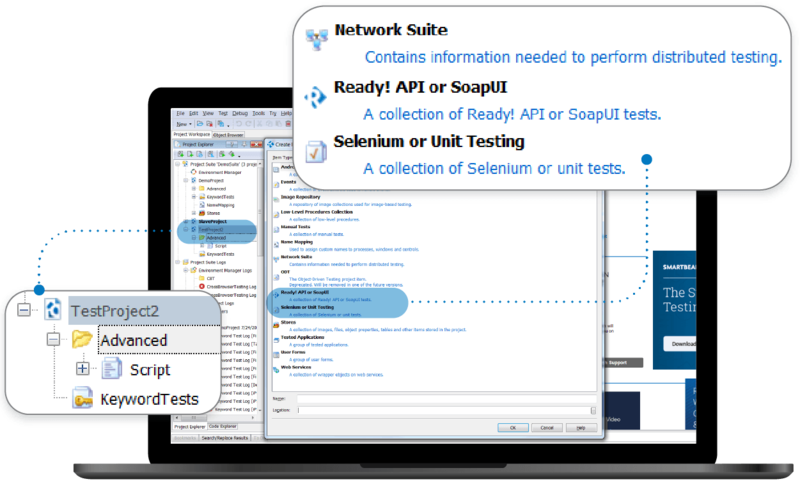 Combine your functional tests in TestComplete with Unit, Selenium, and SoapUI tests to run them as a part of one continuous test suite and optimize test coverage. With TestComplete, you can directly integrate, configure, and run 3rd party unit testing frameworks and tools, including Selenium WebDriver, JUnit, TestNG, and xUnit. To ensure complete test coverage across both the front and back-end of your applications, you can integrate SoapUI tests to create functional and security tests for web service APIs. Scale your TestComplete tests across configurations and remote machines with our built-in Network Suite and parallel and distributed testing capabilities. Parallel testing in TestComplete allows you to simultaneously run your tests across 1,500 real browsers, operating systems and resolution configurations. Distributed testing gives you the flexibility to coordinate the pieces of your test run to execute your automated tests in a specific order, while others run simultaneously. You can manage the Network Suite via the TestComplete user interface or from your keyword tests or scripts, making your continuous testing process even more flexible. SmartBear software believes in an inclusive ecosystem. Our UI and API functional test automation tools continue to expand to support the growing ecosystem of CI/CD tools. You can install plugins from any source, create custom plugins that will suit customer needs, and integrate with solutions to provide end-to-end solutions for all your testing needs. Track changes, merge modifications, and restore previous file versions for individual projects and their child elements directly from TestComplete. Execute TestComplete tests as a part of your nightly test runs or batch and build processes directly in various CI/CD tools after execution. Import and combine your test sets in various ALM tools, which then allows you to schedule, provision, and deploy automated builds for continuous delivery. Increase your resolution time with a runtime engine that identifies issues for you. Get consolidated, detailed reports with screenshots captured during each test run for faster debugging to improve your continuous delivery pipeline. TestComplete allows you to generate event logs and dump files in just a few clicks for comprehensive analysis on your application behavior, including running process threads, CPU registers, modules used by the process, call stacks, and DLL names,– making it easier for you to send packaged results to QA managers and key stakeholders.